Wanderlust Coffee was born from a love of all things coffee. Living in The South, cold brew coffee is a great option, if not a necessity, nearly year round. We like serving it up ready-to-drink. because we think it tastes best when the only preparation required is popping the top on a cold, freshly prepared bottle. No measuring, no mixing, just enjoy it. Why Wanderlust? Well, coffee is a global product; over 50 countries on 4 continents exporting the coveted beans. From the strong fruit flavors of an Ethiopian bean, to the caramel sweetness of a Columbian, exploring the unique tastes from different regions of the world is a big part of the coffee experience. Visit them at wanderlustcoffee.com or on Facebook. PREP is a state of the art co-working facility providing Shared Kitchens, Dedicated Commissary Kitchens for Food Trucks, Food Service Operators, Studio/Event Kitchen and Wholesale Food and Supply Procurement. 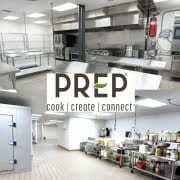 PREP provides the means necessary for Food Entrepreneurs to further their goals in a professional commercial kitchen environment. MORE THAN JUST A COMMERCIAL KITCHEN. Atlanta's Next Culinary Entrepreneur - We Have a Winner! Refuge Coffee Truck making a difference Gloriosa Designs Catering @ PREP!